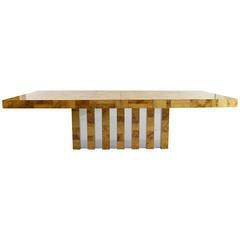 Exquisite monumental burled elm dining table designed by Paul Evans for Directional. The top rests on a curved rectangular base with chrome patchwork tiles. Top is eight feet long with no leaves, with each leaf measuring 15". The original finish has a beautiful amber color with the perfect amount of patina. 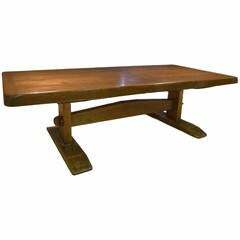 This table would look impressive in any dining room! Signed Paul Evans on the base. 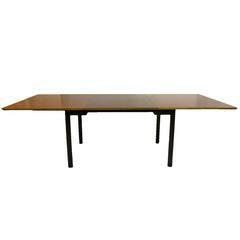 Mid-Century Modern circa 1970s dining table by Paul Evans for Directional. Cityscape design inspired by the Manhattan skyline. 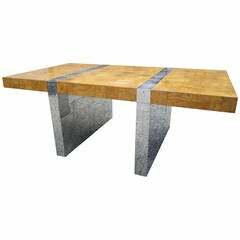 Amazing vintage Paul Evans Cityscape burl wood and stainless steel dining table. Starburst design. Includes one table leaf extension which is 20 in wide.